Discussion in 'Android Devices' started by blaxican25, Sep 29, 2011. If you're a MetroPCS fan and are eyeing the LG Esteem that we first showed you yesterday, here's a quick look at the extended battery cover that will be available at launch. No word on the exact capacity of the battery, but that hump is reminiscient of the HTC ThunderBolt's extended battery, and we'd reckon it's probably in the 2500 mAh range (at least). Interesting - that silver strip above the camera is only on the Revolution - nice of them to photoshop a Revolution and try to pass it off as an Esteem! Glad to see the Esteem is getting official support from the get go... YaY!!!! Yeah, they stuck an extended Metro battery on an LG Rev! Wow. 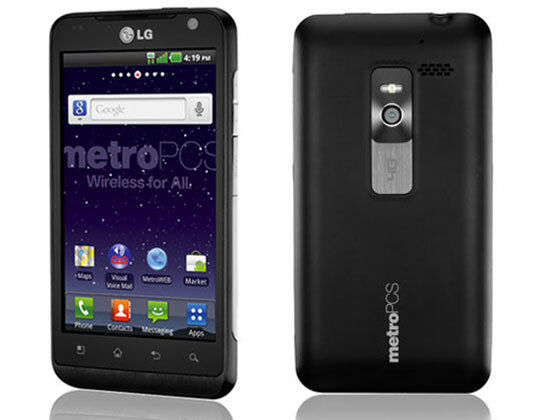 By the way, that "silver strip" on the LG Revolution is just aesthetic. It serves no real purpose, except to make you think the speaker is that big. The LG Rev speaker (behind the case) is exactly the same as the LG Esteem. For Verizon, they just extended the grill for looks. There's also the Mugen Power battery that doesn't require an extended battery cover. I've read some very good reviews about the Mugen battery. [FONT=Verdana, Arial, Helvetica, sans-serif]Mugen Power is the worldwide leading brand of high performance batteries for portable electronic devices, they stand for Performance and Quality. [/FONT][FONT=Verdana, Arial, Helvetica, sans-serif]Their batteries have better performance (higher capacity) and reliability (longevity & safety) than other brands. The superior performance improves run time, often doubling that provided by the original brand replacement. The superior quality results in longer battery life and better protection of the powered device. Let me add that those are used but still a great deal. the oem battery get and extra two hours compared to the generic ones. great deal got mines from this seller bout 2 months ago working great still. With the fact that its the metro style one and it cost $17.95, I decided to jump on it. The price seems a little too good to be true. I hope I didn't make a big mistake. Anyone else bought one from this seller? I was told that the LG Revolution is the same phone. They have an extended battery and door. I purchased it when I bought my phone. It fits and works fine. I don't even use the battery my phone came with because it would only last 4 hours before the phone would die. I only paid $10 on ebay. I paid $13 for mines and it was new, and still gets the job done and last all day till the next. seriously - were/are we just lucky? have there been many problems for others w/these batteries? I really want to get the official extended battery. The phone still looks pretty cool with it, but the cheaper ones from amazon will make my phone look like a brick. All fat and hollow. I know that's shallow of me, but the fat look on the phone is not what I want to carry around. I'm gonna hope and wait for either a new one to go on sale for around $20-25 or try to pick up a used one for $15-20. I know Verizon had a sale on theirs for $25 before. blaxican25 - are you saying, for you (others? ), that it is lasting 2 hours longer even @ 3000mAh? i've had mine about 2 months (3500mAh "amazon cheap one") and it is still working great and i have NO complaints, in strictly "lasting long wise". so, am i, did i just get lucky? normally, should the oem last even longer than mine? don't mean to be redundant, but w/the prices so cheap and tbh - the money isn't really a concern, but if i can get 2 that last even longer, for the price of one and the "looks" are the only downside, then so be it. and of coz, i am sure, like all tech products, some have had bad results w/all types of batteries, so this is more of a general question, statement, ramble, lol. & i hear'ya justainchoe, regarding it looking like a brick, tho, tbh - it fits well in my hands & i don't mind it! Doh,ffs - can you cancel your order? Oh, I didn't order the previous links. I bought the new one Blaxican linked for $17.95 shipped. I put that because I wanted to wait till next week to buy it but I couldn't pass up this price. For $18, it's almost as cheap as the generics. I believe retail for this is a ridiculous $50. Not sure if the OEM 3000mAh will last 2 hours more than a generic 3500. It's possible that you were lucky and the generic one was done right, but often times it isn't. How long does your battery compare to the stock 1500? Is it more than double, less than double, or basically double the stock battery? What particular make/model was it? Ok, I ordered the extended battery two days ago and it's already arrived. It's a lot heavier than I imagined and it doesn't fit as perfect as I would've hoped. There's a small creaking sound on the hump that sticks out. That said, overall I'm happy with my purchase. I can't wait till it charges up so that I can just go nuts on the usage without having to worry too much about battery life. Thanks Blax for the link. your welcome, make sure its snaped down all the way..